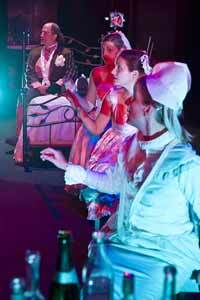 The Wedding, presented by Lit Moon Theatre Company. At Center Stage Theater, Friday, May 16. The natural world throws off sparks of genius all the time. No matter how many times birds fly by in formation or the sun sets or the moon rises, there’s still a thrill of surprise in the recognition of old patterns made new. Lit Moon Theatre’s current production of The Wedding: A Matrimonial Musical Fantasy captures the magic that has animated the company’s recent work with Shakespeare and adds some new dimensions of accessibility, warmth, satirical humor, and wisdom. It’s also a new kind of musical, wholeheartedly embracing the popular song like a Santa Barbara version of the Off-Broadway hit Spring Awakening. Victoria Finlayson, Erin Brehm, Kate Louise Paulsen, and Stanley Hoffmann fly to new heights in this, Lit Moon’s breakthrough show. From left: Stanley Hoffmann, Kate Louise Paulsen, Erin Brehm, and Victoria Finlayson as the bachelor and the three brides. The songs, written and performed by Jim Connolly and Anna Abbey, with vocal assistance from the female three-quarters of the cast, are great. They throb with life and ooze the kind of jubilant passion that makes you want to roll down the car windows and turn up the radio. The story has been freely adapted from Nikolai Gogol and owes as much to its creators’ collective imagination as it does to the Russian original. In Gogol’s play, The Marriage, a single middle-aged man approaches marriage through the services of a matchmaker. In Lit Moon’s The Wedding, three potential brides vie for the affections of a solitary-and entirely silent-man, played to comic perfection by Hoffmann.